The survey was conducted in November 2006 among 502 individuals (a representative sample of the adult population in <?xml:namespace prefix = st1 ns = "urn:schemas-microsoft-com:office:smarttags" />Israel). The results of the 2004 survey are shown in parenthesis for comparison. 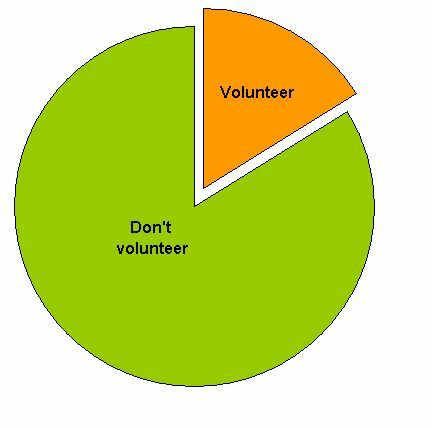 2) How much time do/did you devote to volunteer work? 3) Overall, how many hours a week or month do/did you devote to volunteer work? 4) Is/was your volunteer work part of the public service (hospital, citizen watch, school, prison etc) or any other activity run by the local authority? 6) Are/were you involved in volunteer activity through work or another business related organization? 9) Did you receive adequate training for the volunteer work you currently do/ did in the past? 10) Does the organization in which you volunteer follow sound management practices? 11) Does the organization in which you volunteer/ed in serve the purpose for which it was established? 12) Some people argue that most of the issues that volunteer organizations deal with should be handled by the government. Others disagree. What do you think? 13) Do you think that the work of volunteers and volunteer organizations allows the government to shirk its responsibility to help the needy? 14) Should donating money to a charity be considered volunteer work? 15) Recently, some very wealthy people have funded various causes, instead of the government. Do you think it is justified, considering the country's economic situation, that private individuals should fund some projects instead of the government? 16) Are you under the impression that volunteer organizations follow sound management practices? 17) Do most volunteer organizations serve the purpose for which they were established? 18) Does the Israeli public tend to volunteer more or less, compared to past years? 19) Currently, are you willing to take on volunteer work? 20) Do you know where to inquire in order to volunteer? Thank you to Dr. Mina Tzemach for conducting the survey.